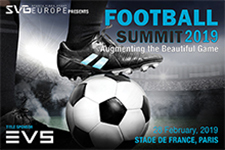 EVS EMEA senior vice president Marc Caeymaex will lead off SVG Europe’s Football Summit in Paris on 28 February as Title Sponsor for the event. The Football Summit will take place at Stade de France in Paris. Registration for the conference will close this Thursday, 14 February. Along with the EVS Title Sponsorship, we are also very pleased to announce that Imagen has taken the Technology Case Study Presentation sponsorship. Vizrt is Session Sponsor for ‘Football Graphics Showcase: How to create show-stopping AR’. The ‘Coming to you in 3, 2, 1…A Match Directing Masterclass’ session is sponsored by Slomo.tv. And our concluding ‘Taking them all on: How 5G will simplify Remote Football Production’ session is sponsored by LiveU. Tabletop Sponsors for the event are Evertz, EVS, Imagen, Mobile Viewpoint, Panasonic Business, Sony and TVU Networks.